It's been a while since we've had a solo album from Terri~B, vocalist, musician and songwriter extraordinaire from Census of Hallucinations and The Rabbit's Hat. Her latest effort, Big Dictionary, melds the progressive influenced torch song nature of her 1998 album Wrap Me In Your Skin, with the psychedelia of Census of Hallucinations, to produce a 23 track ALBUM of songs and a truly unique brand of psychedelia that fans of her work with Census of Hallucinations will surely understand. I put emphasis on ALBUM because Big Dictionary really must be listened to in its entirety to be fully appreciated. Sure, there are lots of stand alone songs on the album. But there are numerous transitional bits that string everything together to create what for me is a single 70+ minute performance. Songs like "Ghost Train", "Sad Disguise", "Lucky", "Beautiful Places" and "The Summer House" will appeal to fans of Terri's Wrap Me In Your Skin and Rabbit's Hat albums. She's a seductive vocalist with a knockout voice who really shines on such well written songs, backed by crack musicians and solid production. On the more spaced out side are songs like "Golden Wings" and "Open Up", which are, at their core, pop songs, albeit with a trademark Terri sound. 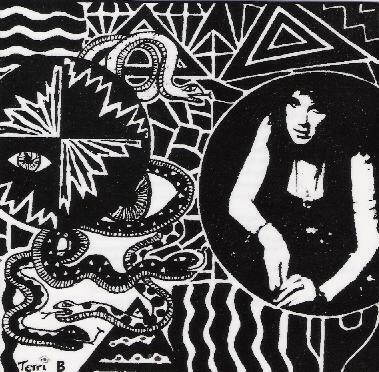 But the cool tripped out rocking psychedelic guitars and prog oriented atmosphere take them into a realm that straddles the progressive rock, psychedelic and pop worlds in a way that is distinctively Terri's, and really everything about Pet Hippy Productions. "Mooncats" is a full on rocking space-psych-punk tune. "Flies on a Corpse" is a psychedelic avant-garde sound-art freakout piece. And "Ravenous Radicals" is a whimsical alien track with riotous lyrics that sounds like it's played by the Star Wars cantina band on acid. But then there are the numerous brief tracks that string the songs together, adding a collage like nature to the album. "Dolly" is like a psychedelic childrens song, with a lysergic carnival atmosphere and colored by chill-out electronica grooves and other freaky efx. "Them" is a deep space spoken word piece on which Terri is a dead ringer for Gilli Smyth. "Parkers" is another spoken word piece, this time being more like a Hawkwind inspired Robert Calvert performance. Very spaced out and intense. This is followed by "Big Dictionary" which is a whacky, frenetic cross between the Residents and Vas Deferens Organization. Wow, I could go on through all these tracks but hopefully you get the idea. As I said, you really need to settle into the album for the duration to appreciate the variety of music and the way it's all so seamlessly stitched together. The studio work and production are key to Big Dictionary's success, and a close listen reveals that minute details have been attended to with careful thought and care. Call it space rock and psychedelia for the new millennium. Terri and all at the Pet Hippy Productions mothership are so very much in a special musical world of their own. Space/psych fans who have not yet heard these folks are missing out big. For more information you can visit the Pet Hippy Production web site at: http://aural-innovations.com/pethippy.